Maybe it too late to writing there, but I have to. 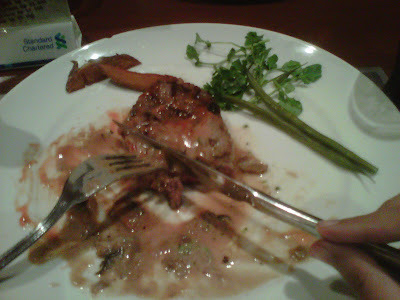 I miss eating great steak on 2013 when I'm still trainee at Surabaya in my prev company. I miss the taste of Holycow, in that time Holycow just open their branch on Jakarta, nothing more. Do you know I should wait for business trip to Jakarta if I really want to eat it. But no I don't need to do it because I can find nearest branch not far from my home. On another over-time working day, me and my friend popped into Wagyu Smith Restaurant in one of the famous mall at Surabaya. I've been so curious about the taste of wagyu steak that include to the name of the restaurant. I read a few review about this and they write it has a great taste wagyu steak anyway. We expected the taste with worth their premium price. And could making us willing to take our time to stop by returning despite fairly premium price later. I have to admit the plice was nice and has comfortable atmosphere for dinner, I love it. I ordered wagyu tenderloin steak that time and my friend eat the wagyu burger. Sure... quite edible but I found out that tasty marinade less penetrated into the flesh and there was still musty 'beef' that not completely stripped away. Looks like meat marinade seasoning just stuck on the surface, but not seep enough deep on the meat. Hmm. I still adore the taste of Holycow more and nothing beat it until now.